John Young, the ninth man to walk on the moon, flew on three NASA programs: Gemini, Apollo and the space shuttle. 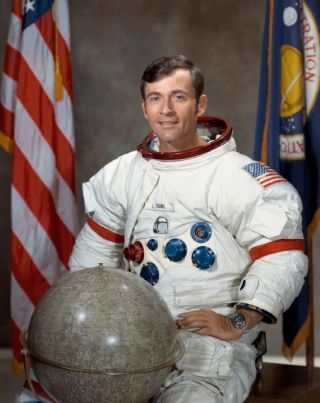 John Young was NASA's longest-serving astronaut. He first became an astronaut when the agency was flying two-man space capsules. He left when the agency was flying the space shuttle. In between, he flew six space missions — the first person to do so. In his decades with the agency, Young racked up several milestones. He made it to the moon's neighborhood twice, and walked on it once. He commanded the first space shuttle flight and then came back into space yet again to command another. His flight experience spanned three different programs: Gemini, Apollo and the space shuttle. In 2004, with an impressive 15,000 hours of spaceflight training across four decades, Young retired from the agency. Young died on Jan. 5, 2018, following complications from pneumonia.. He was 87. John Watts Young was born on Sept. 24, 1930, in San Francisco, Calif. When he was 18 months old, Young's parents moved, first to Georgia and then Orlando, Florida, where he attended elementary and high school. Young earned his bachelor of science degree in aeronautical engineering from the Georgia Institute of Technology in 1952. After graduation, he entered the U.S. Navy, serving on the destroyer USS Laws in the Korean War and then entering flight training before being assigned to a fighter squadron for four years. Young graduated from the U.S. Navy Test Pilot School in 1959 and served at the Naval Air Test Center at Naval Air Station Patuxent River in Maryland, where he evaluated Crusader and Phantom fighter weapons systems. In 1962, he set world time-to-climb records to 3,000 and 25,000-meter (82,021 and 9,843-feet) altitudes in the F-4 Phantom. NASA picked Young as an astronaut in September 1962, just as the one-man Mercury spacecraft program was winding down and the Gemini program was starting up. In fact, Young flew on the first manned Gemini flight — Gemini 3 — in 1965, transferring his test pilot skills to figuring out the new spacecraft. Young then joined Michael Collins to do two rendezvous with two separate target Agena spacecraft in 1966, during Gemini 10. Working in close vicinity with other spacecraft was a requirement for moon missions, when two spacecraft would need to dock together to get to the moon and return home. This experience came in handy for Apollo 10 in 1969, which featured the first moon-orbiting docking between two spacecraft. At the controls of the command module Charlie Brown, Young successfully joined with the lunar module, Snoopy, that had been doing a landing test a few miles above the surface. "Snoopy and Charlie Brown are hugging each other!" said an exuberant Tom Stafford, who was commanding Apollo 10. Young went back to the moon in 1972, during Apollo 16. He commanded a scientifically ambitious journey to the Descartes highlands, searching for volcanic rock and some possible clues to the moon's history. He and his crewmates, Charles Duke and Ken Mattingly, brought back 200 lbs. of rock during more than 20 hours on the surface. Young and Duke only found sedimentary rocks along the way, which surprised scientists back home. Despite the challenges, however, the men kept their sense of humor. They did a controlled but wild-looking test with the lunar rover, for example, skidding it across the surface in front of a video camera. "One-sixth gravity on the surface of the moon is just delightful," Young said in a 2006 interview with NASA. "It's not like being in zero gravity, you know. You can drop a pencil in zero gravity and look for it for three days. In one-sixth gravity, you just look down and there it is." In 1974, Young was named the fifth chief of the Astronaut Office, after serving for a year as the office's space shuttle branch chief. For 13 years, Young led NASA's astronaut corps, overseeing the crews assigned to the Apollo-Soyuz Test Project, the approach and landing tests with the prototype orbiter Enterprise, and the first 25 space shuttle missions. In 1981, Young moved to a very different kind of vehicle: the space shuttle, which acted and performed more like a plane than a spacecraft. Development on the ambitious vehicle was not without its challenges, as Young and his crewmate Robert Crippen discovered. "I remember [senior NASA official Bob] Gilruth telling me it's going to be as reliable as a DC-8 and right after he said that, Crip and I, every time we went out to Rocketdyne or somewhere to see what was happening, engines were blowing up. So I wasn't sure it was going to be as reliable as a DC-8. It was a lot of fun," Young quipped. Young and Crippen lifted off in the space shuttle Columbia in April 1981, on a test flight of a vehicle that had never before been used in space. There were questions about how its systems would perform, and whether the new tile heat-shield system for re-entry would hold up. The flight was a success. Still with a taste for spaceflight, Young returned to space once more at the helm of STS-9. This flight, like his last Apollo mission, was scientifically heavy. The crew flew the experimental Spacelab module for the first time, performing hours of experiments during 10 days. "The mission returned more scientific and technical data than all the previous Apollo and Skylab missions put together," NASA stated. After the loss of space shuttle Challenger and its seven-person crew in January 1986, Young penned internal memos critical of NASA's attention to safety, a topic he had championed since his days flying Gemini. Young expressed concern over schedule pressure and wrote that other astronauts who had launched on missions preceding the ill-fated STS-51L mission were "very lucky" to be alive. Young was subsequently reassigned to be special assistant to the director of the Johnson Space Center for engineering, operations and safety until 1996, when he was named the associate director for technical affairs, a position he held until his retirement from NASA on Dec. 31, 2004. Young was the recipient of many honors for his contributions to space exploration, including the Congressional Space Medal of Honor, NASA Distinguished Service Medal, Rotary National Space Achievement Award, and six honorary doctorates. Young was inducted into the National Aviation Hall of Fame in 1988 and Astronaut Hall of Fame in 1993. He was awarded the NASA Ambassador of Exploration in 2005, including a moon rock he assigned for display at the Houston Museum of Natural Science, and was bestowed the General James E. Hill Lifetime Space Achievement Award from the Space Foundation in 2010. A stretch of Florida State Road 423 that runs through Orlando is named John Young Parkway in his honor. Reflecting on his time as a veteran of three programs, Young said the role of an astronaut has not changed, although the technology certainly did. "I don't think it changed it any," he told the Houston Chronicle in 2004. "You just had to learn a lot of systems and learn how to operate them and be a systems person. That's what we were. We were systems operators." Additional reporting by Robert Z. Pearlman, collectSPACE.com editor.